I really hate to let a month go by without posting. I think mostly because it annoys me to see a missing month in the list on the right side of the page...;) Anyway, I would say "this month has been crazy" but that is just really life-no more or less crazy than it ever has been. May is always a succession of "ends" and I'm kind of just ready for it to be over, although June will have it's own packed schedule! -I am working away on my reading list for my book challenge (If you want to see what I've read, check out my Pinterest board where I track it here.) I have read dozens of other books this year, but they either don't fit any of the categories, or they aren't what I would consider "challenge-worthy". 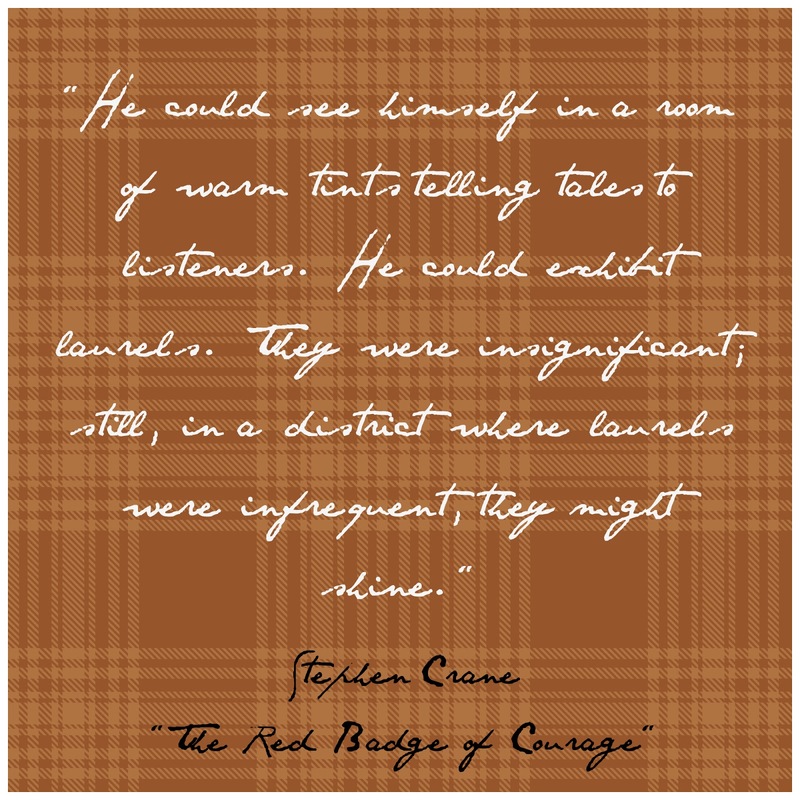 I just finished, The Red Badge of Courage and if you are rolling your eyes because you read that in high school, well good for you, but I managed to put it off until my mid-thirties. I was completely enamored of Crane's writing style-it was so beautiful. It all came together, though, because since I finished the book last week, we attended a Civil War reenactment Saturday, and with all Crane's vivid imagery still in mind it was all just so poignant and meaningful-especially in connection with Memorial Day... Reading the classics as an adult has given me such a greater appreciation for them. I think often they are *somewhat* wasted on the young. That is not to say that I don't see in value in high school students reading, To Kill A Mockingbird but there are just so many more layers of meaning when you can add real life experience to the mix! -I've been mulling over multilevel marketing recently. I have had a swarm of friends who have been sucked in recruited , joined MLMs in the past few months and it has caused me to be very aware of them. You probably guessed that I am a teeny bit negative towards them, and it has nothing to do with the products. I just couldn't quite put my finger on why I was not able to fully embrace the concept and then I read this article "The Divine Rise of Multilevel Marketing". I think the reason that they make me bristle is this: I just wish that women (or really anyone involved in that type of thing) would put an equal amount of energy into evangelism that they do into their "business". Many of these people make little or nothing, (according to the article, as little as 1% of those involved make a profit, and I have seen those figures other places) but they spend hours of time and energy to sell "their" product. I don't have a problem with that-I spend hours of time and energy on this blog and I literally have never made a cent. It's just that I try to devote a greater amount of time and energy into sharing the Gospel, and I also try to share my faith here. Plus, I've never tried to sell you anything that benefited me. ;) But, I think that if we viewed every meeting, every Facebook post, every Instagram photo, every brief interaction as an opportunity to promote the name of Christ, rather than skin-care products, cookware or weight-loss tools, I think we would see a dramatic gain for the Kingdom. Please hear me: I support many MLM consultants, for books, for workouts, for kitchen gear, for jewelry. (I fell in love with the mission of Trades of Hope and have made a number of purchases in the last few months.) However, I know these women personally, and they are seamlessly integrating their faith in Christ with their desire to better the world through sharing things in which they believe. However, I have other "friends" who have clogged my newsfeed, email and ears with endless babble and underlying just have a desire to "recruit" me so that they can move up in the food chain. Those are the ones that I wish would find their fire for the Lord and use their energies to fuel that instead of sales of products and promises of commission. I have decided though, that it has definitely done something good for me-it has encouraged ME to share the Gospel more openly. I would never talk to a Costco employee or a dental hygienist about a product I was selling, but I have knowledge about everlasting life, and I am eager to share that. Plus, I won't lie: I've decided to co-opt marketing techniques in an effort to promote our VBS. There is literally no shame in my game! -I've been working on better eating habits and I have discovered a few things. Namely, I do not hate almond milk and putting cottage cheese into scrambled eggs makes my heart sing. I have been trying to branch out and had some epic fails (Greek yogurt is NOT a substitute for mayonnaise, no matter what Pinterest tells you. ), but I have also had some successes. I figure every little bit helps! I tried making a carrot smoothie (As long as you don't buy into that it "tastes like carrot cake" you'll be good) and eating plain oatmeal. I actually *like* plain oatmeal now! However, I made overnight oatmeal last week (You can see it on FB here.) and that was a definite fail. I think I needed Dutch-process cocoa, my regular baking cocoa was far too bitter. Yuck! I think I am going to try a different recipe, one without cocoa, so if you have a tried-and-true one let me know! So what does May hold for you? Did you get totally lost in my ramblings? Do you have really positive things to say about MLM? I'd love to hear what you have to say!